The first time I see Sasha Felikson he is on the porch of Doi Moi grilling ribs and chanting: “Jewish boy cooking pork!” It’s during the 2017 Dine-n-Dash event to benefit World Central Kitchen. I am amused and intrigued. Who is this crazy guy? I wonder. As it turns out, he was the Executive Chef of the restaurant. I am captivated by his unbridled enthusiasm, which I experience more fully when I interview the chef for Jewish Food Experience. 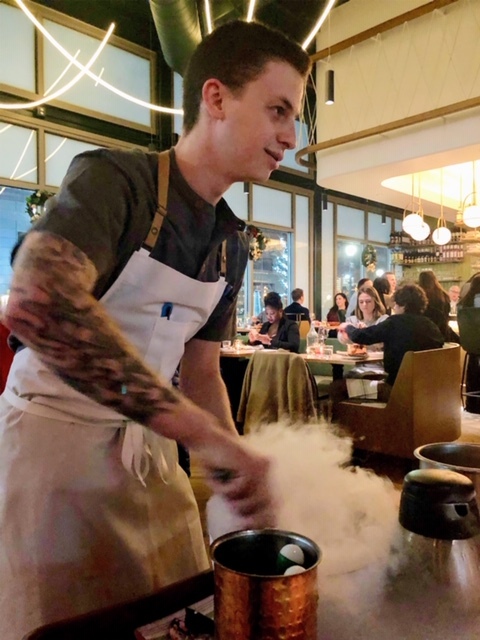 When I learn that Felikson is going to serve as Executive Chef for the new Julii at Pike and Rose in N. Bethesda, I take a page out of his playbook and squeal with delight. Julii is a French-Mediterranean restaurant from Ted Xenohristos, Ike Grigoropoulos and Dimitri Moshovitis, the founders of Cava. 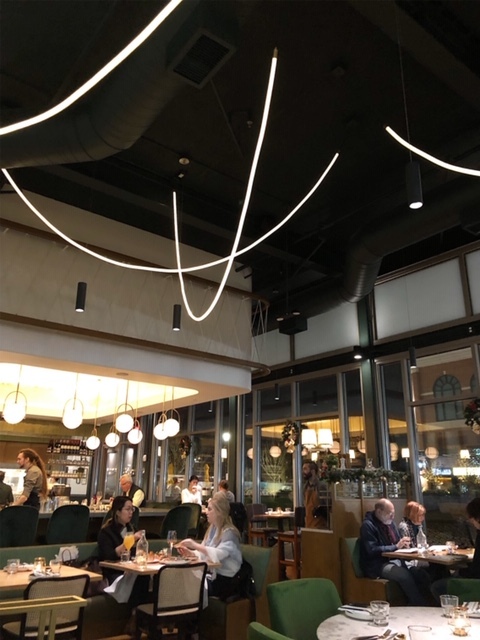 It is a new addition to the fast-growing Pike and Rose development, and one that elevates the dining options there. The restaurant name and concept are based on a town called Forum Julii, which was founded by Julius Caesar. The town was on a trade route that began in Paris and traversed through to the Mediterranean Sea. This translates to dishes with a potpourri of French and Mediterranean flavors. Like a trade route, the meal you build here can go in multiple directions. We’ve all become accustomed to “starters” and “small plates” replacing the term “appetizer” on restaurant menus. A meal at Julii opens with hors d’Oeuvres, which certainly sounds more elegant. Whatever you call them, the offerings include French onion soup, Alsatian tart with bacon and gruyere, and shakshuka- an Israeli dish featuring eggs and tomatoes. 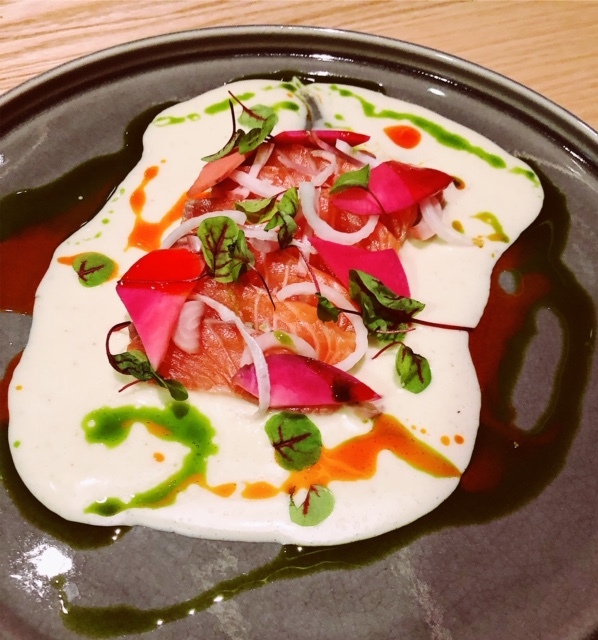 Salmon crudo takes on a Greek accent with ladolemono lemon sauce, and then veers Syrian with allepo pepper. The dish is a beauty, with clean, bright flavors. For something meatier and more indulgent, you can feast on roasted bone marrow or foie torchon with peach preserves. If you feel like steering your entrees more fully in the direction of France, there is salmon niçoise salad, ribeye au poivre, and roasted duck with citrus and duck sauce. On an early visit to Julii, roasted duck does little to impress. The meat is dry, which could be remedied if there were more than a few droplets of sauce. On the plus side, the deconstructed salad niçoise is nicely done. For those with a hearty appetite, it’s perhaps best suited for lunch, or paired with a heavier dish. I return to Julii a few weeks later to find a restaurant staff and food that reflects more confidence and seasoning. Crispy trout pairs French and Turkish flavors. Butter, lemon, and parsley meuniere sauce play well with urfa spice, a Turkish pepper that is sweet and smoky. Lamb tagine is currently the main attraction at Julii. It’s ceremoniously served in a brightly colored clay tagine. When the top is lifted, an enticing aroma from alder wood chips floats through the air. 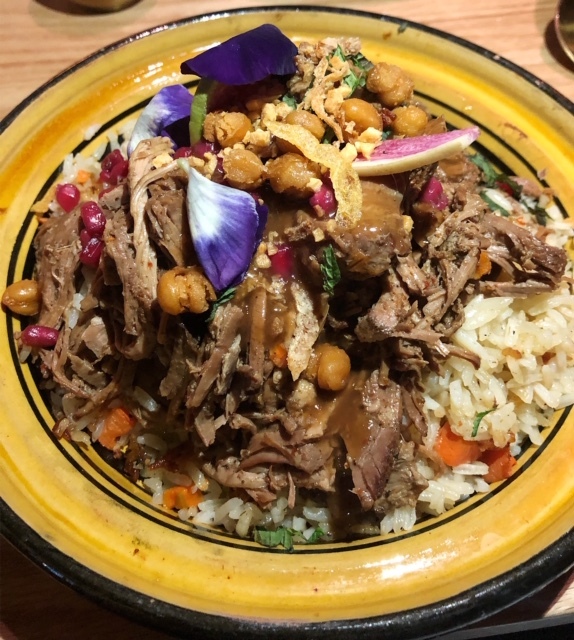 The dish is loaded with chunks of tender lamb, crispy chickpeas, rice, and roasted carrots, with a touch of sweetness from pomegranates. The $30 dish is generously portioned. Leftovers make a perfect breakfast- or if you have the willpower to hold out- lunch for the next day. Felikson concedes that the lamb is a signature dish, but thinks the sleeper hit is stuffed cabbage with truffle mushroom jus, mushroom bacon, and pickled mustard seeds. Don’t look for your grandmother’s version. This isn’t it. My husband is wowed by the blend of sour and umami. The healthy, yet refined entrée is $19, bound to make it a powerful draw. Accompagnements (more French!) include pommes frites and pommes puree, brussels sprouts, and roasted mushrooms. For comfort food on these frigid nights nothing beats the whipped potatoes. Dessert includes nitrogen ice cream, prepared tableside. The restaurant is too small for an ice cream machine, says Felikson, and this is his alternative, which takes up minimal space and is less costly. If Felikson is serving, don’t miss it. His zeal for the confection is infectious. He’s currently making oat ice cream with cream and eggs from South Mountain Creamery near Frederick, Maryland. The creamy frozen dessert is served with toppings of miniature marshmallows, rainbow sprinkles, and butterscotch chips. The chef completes the presentation at our table and wheels the cart back through the restaurant, humming and skipping. This guarantees that more diners will be enticed to give the dessert a whirl. The glass-enclosed restaurant is brimming with pizzazz. I imagine it’s warm and inviting during the daylight, although I’ve yet to experience it. At night it takes on a more elegant air with floating rope lights, smartly upholstered green banquettes, and copper accents. After two visits to Julii, I’m eager to return for a seat at the marble-topped bar with its decorous gold-leaf dome, orb lights, and a close-up view of the open kitchen. Route 355, or Rockville Pike as it is more commonly known, is a modern day trade route with its strip malls and dozens of restaurants. Pike and Rose is altering the landscape with a multitude of options for shopping and dining. 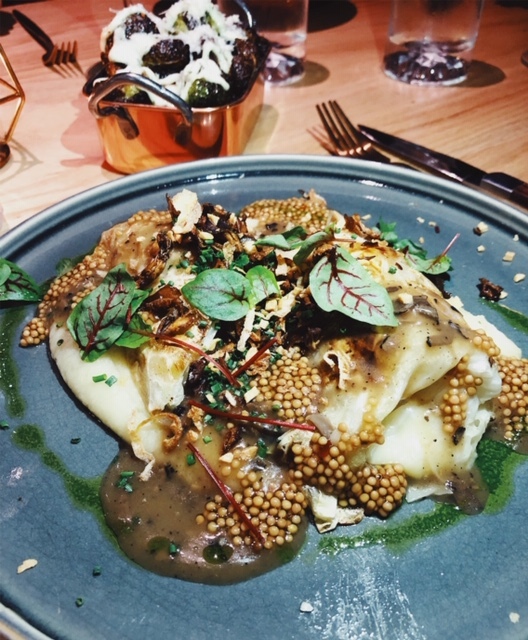 Julii adds cache and style to the mix, with a feisty chef who is spicing things up every step of the way. Dining out is my passion, and often times the culmination of hours of research. 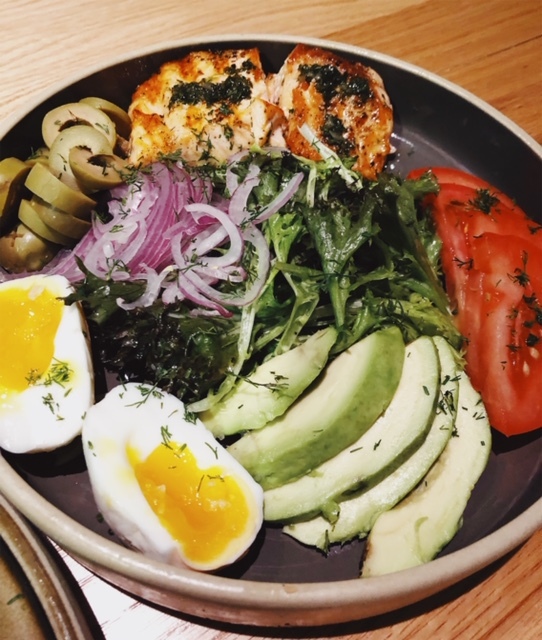 This restaurant review blog reflects my journey as I try to keep up with my restaurant wish list for the DC area where I live, and in my travels. It’s a struggle at times, but with the help of family and friends, I manage. @TheMoCoShow Kuya Ja & Inferno Pizzeria! @staceyviera @HarvardChanSPH So awesome. Congrats! @nevinmartell @MessHallDC @PiccolinaDC @PhilotimoDC @dauphinesdc @hatoba_dc @emiliesdc @SloppyMamas @r_ratino thanks for sharing!